In the 2000s, the government took steps to limit the supply of prescription pills. Pharmaceutical manufacturers were sued for falsely marketing their products as non-addictive, doctors were prosecuted for overprescribing pain pills, and authorities tightened limits on painkillers. By 2013, prescription drug abuse leveled off as pills became harder to find, but that didn’t help Americans who were already hooked. When addicts couldn’t get pills, they found more dangerous drugs. Many started using heroin, an extremely potent opioid that is made from the sap of the opium poppy. Soon, heroin overdoses began skyrocketing and as usage became widespread, users with a high tolerance for heroin began seeking even stronger opioids. And that’s part of what led to fentanyl: a synthetic opioid that is more powerful and cheaper to make than heroin. 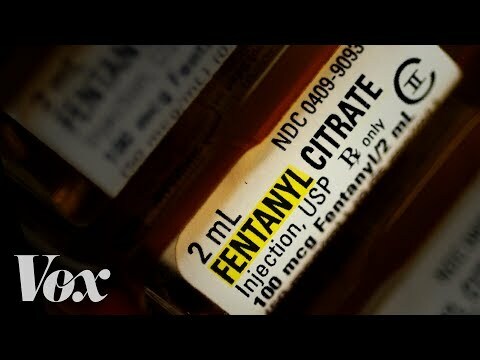 Unlike heroin, fentanyl can easily be made in a lab. But fentanyl is about 100 times more potent than morphine. Drug traffickers have been using it to cut heroin to increase the potency and profits from their product. So heroin addicts can consume fentanyl unknowingly, which increases the chances of an accidental overdose. Three Years after heroin deaths began to spike, fentanyl overdoses began rising. Already, new opioids are fulfilling the next iteration of this progression. Carfentanil, an opioid used as an elephant tranquilizer, is a growing cause of overdoses in The United States. This photo compares a potentially lethal dose of all three drugs, showing that it could take just a few grains of carfentail to kill someone. In 2016, preliminary estimates of Americans that died by drug overdose are as high as 65,000 people. Experts estimate 2017 will be even worse. As long as people are addicted, they’re going to find ways to satisfy that addiction even if it means using more dangerous drugs, like fentanyl.. Previous PostWhy Is There an Opioid Crisis?